Chandraprabha Vati strenghens the urinogenital system and is useful in Diabetesmellitus, Urinary tract infection, Piles, Fistula and Leucorrhoea. Blend of various herbs makes it useful in treatment of UTI, difficulty in urination, urinary calculi. It also reduces itching, burning and inflammation of urinary organs and help in relieving constipation, bloating, abdominal colic pain, lower back pain, improves digestion. It also acts as an effective rejuvenator, promotes good health and corrects metabolism. Directions of Use : 2 tablets daily or as as directed by the physician. 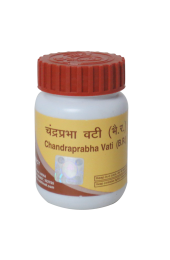 Packing : Chandraprabha Vati is available in packing of 60 tablets.